You Become What You Believe! I was in a training recently and the facilitator said these words, "You don't get what you want, you get what you believe." You all know I LOVE quotes so I had to do my research and find out who these words belonged to. I soon realized that this was an adaptation of one of Oprah's famous quotes, "You become what you believe." There are a lot of "fluffy" quotes that make you feel all warm and fuzzy when you read them but this quote was impactful because it put the responsibility on the individual to become the best version of themselves. Sometimes we put so much focus on things like "promises", "miracles, and "favor", that we forget that we play a key role in our destiny. Many people, particularly Christians, are sitting down on the sidelines of their lives waiting for their promises to manifest yet failing to mobilize their faith. James 2:17 let's us know that faith, when not accompanied by action, is dead. And quite frankly, much of what we say we believe, we don't. We want it, we wish it, but we don't believe it. Why do I say this? Because what you believe, you pursue! 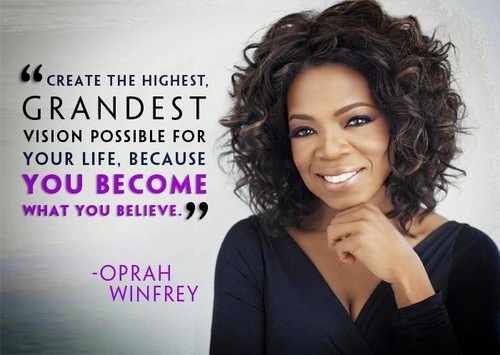 When Oprah says, "you get what you believe", what she is saying is your dreams, goals, and aspirations all hinge on what you think about yourself. We can only act on what we believe. If you believe that you are talented and gifted, then your talents and gifts will be fully operational in your life. But, if you think you're a failure and you're not good enough, then that will be your reality instead. It's really up to you. We think of God as this genie in a bottle who grants us wishes when in actuality he created us to be our own genie and make our own wishes come true. God didn't say "Pray to me and I will move the mountain", he said, "Speak to the mountain yourself and it will move." What do you believe about yourself? Have you been dreaming big? Have you been dreaming at all? Have you mobilized your faith? Answer these questions honestly and figure out how your thinking has either hindered you or helped you. We often long for external support and validation but what really matters is what we believe about ourselves. I'm not saying you don't need the support of others, but their support will be futile without your personal will, drive, and determination. So, I'm encouraging you to change the internal dialogue that you have with yourself and put some walking shoes on your faith! Believe it and pursue it!